Brown Sunburst finish. MADE IN JAPAN. May 1980 Fujigen manufacture. Serial number stamped on the neck plate. Has several marks, nicks, and scratches on it and a few areas of touched up finish chipping and nicking. Brown Sunburst finish. MADE IN JAPAN. May 1982 Fujigen manufacture. Serial number stamped on the neck plate. Neck is straight and in solid condition. Frets and fretboard fine. Gave it a few good runs and it sounds fantastic! The Ibanez RG80E features a 27" scale-length neck, unveiling a plethora of down-tuning possibilities. The Jatoba fingerboard, inlaid with classic white dots, enhances the RG80E's visuals and its jumbo frets enable all the wild string-bending you can manage. Considering the age of the guitar it is in very nice condition. Original finish and parts. Neck is straight. Action is low. Frets are in good condition with no buzzing. Two small dings to the body as shown in the photo #6. Bass is in nice condition for its age. I recently restrung with GHS bass strings. 2 Allen keys, one for the neck and one for the bridge height screws are included. Guitar Info. From Guitar Dater Project. The RG80E features a 27” scale-length neck, unveiling a plethora of down-tuning possibilities. The Jatoba fingerboard, inlaid with classic white dots, enhances the RG80E’s visuals and its jumbo frets enable all the wild string-bending you can manage. See pictures for details on the condition of the case. 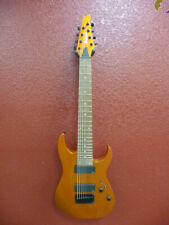 Ibanez RG80E Roadster Orange Metallic 8-String Electric Guitar, New! The RG80E features a 27" scale-length neck, unveiling a plethora of down-tuning possibilities. The Jatoba fingerboard, inlaid with classic white dots, enhances the RG80E's visuals and its jumbo frets enable all the wild string-bending you can manage. See photos attached. Bass has been well cared for and very loved for many years. Videos of similar model bass tone. The demands of down-tuning require a specifically designed responsiveness not found in "normal" guitars. Longer-than standard yet not overly long. The neck is still considered a "fast" neck for speed soloing. One of the rare models front and center slanted to SSH layout. Accessory: non-genuine soft case, arm. Weight: 3.87 kg. Fret residue: about 60%. "The RG80E features a 27” scale-length neck, unveiling a plethora of down-tuning possibilities. The Jatoba fingerboard, inlaid with classic white dots, enhances the RG80E’s visuals and its jumbo frets enable all the wild string-bending you can manage. Sweetwater is an Authorized Ibanez Dealer. There are fine scratches on various parts of this guitar that are not shown in pictures. These fine scratches do not show up well in pictures. Guitar strings. The SRMD200 features a Poplar body, stunning new finish and a newly-designed pickguard. Electronics consist of an Ibanez Custom Electronics 2-band EQ and an Ibanez DXP neck pickup and DXJ bridge pickup for extra punch. Bridge Pickup: Ibanez EXF Humbucker. Neck Pickup: Ibanez EXF Humbucker. Case: None. Body Material: Mahogany. Sweetwater is an Authorized Ibanez Dealer. There is a crease in finish on body top upper bout bass side. These fine scratches do not show up well in pictures. Discontinued products, closeouts, and used products. Its agathis body is comfortably shaped and sculpted and its neck shape is easy to play. If you’re not satisfied, neither are we. It’s that simple.